Hudson used the Super Bowl’s massive television audience for her first public appearance since the October slayings in Chicago of her mother, brother and 7-year-old nephew. TAMPA, Fla. - After one deep breath, Jennifer Hudson returned to the spotlight Sunday with a flawless performance of the national anthem before the Super Bowl. Wearing a flowing white top with black pants and a cropped black jacket, the 27-year-old singer/actress looked apprehensive when she first climbed onto the round blue stage on the field of Raymond James Stadium. Then she took the breath and launched into the anthem. Hudson used the Super Bowl’s massive television audience for her first public appearance since the October slayings in Chicago of her mother, brother and 7-year-old nephew. Her estranged brother-in-law has been charged in the killings. Hudson, who clocked in at 2 minutes, 13 seconds, looked relieved when she was through. “I told her ’Touchdown!”’ Minor told The Associated Press after the performance. Minor, the music director for "American Idol," has produced numerous Super Bowl pre-game performances, including Whitney Houston’s 1991 anthem in Tampa that’s considered the benchmark for singers. Minor said Hudson was very calm and prepared, and he counseled her to take the deep breath before she began so she could put herself in the moment. Although entertainers can perform live, Minor insisted that Hudson and Faith Hill, who sang “America the Beautiful” before the national anthem, use the tracks the NFL requires them to submit a week before the game. Singing the national anthem at the Super Bowl is considered a prestigious invitation, with all artists trying to match or better Houston’s version, which was performed during the first Iraq war. But Hudson’s performance was more personal than patriotic. 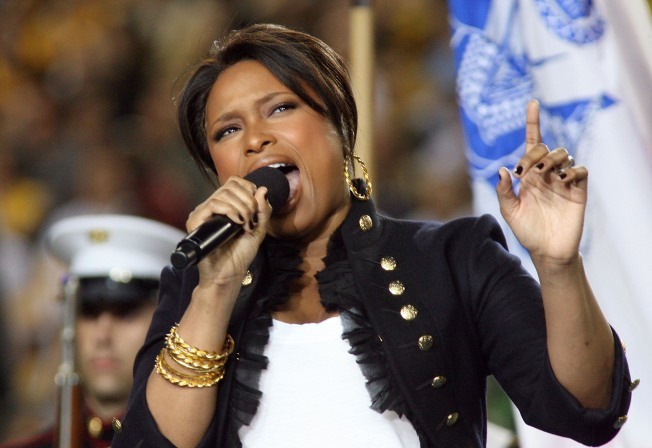 Hill, who performed the anthem in 2000 in Atlanta, praised the former American Idol contestant for choosing the Super Bowl as her return. Hudson’s now expected to resume her active work schedule. Hudson, who won an Oscar for best supporting actress for her role in “Dreamgirls,” is scheduled to perform at next week’s Grammy Awards. And her new video for “If This Isn’t Love” is set to debut the week of Feb. 9. Hudson has yet to speak publicly about the slayings.